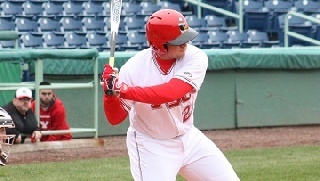 After a weekend in which he hit five home runs and posted 11 RBIs, Youngstown State junior first baseman Andrew Kendrick was recognized on Monday at the national and conference level. Kendrick was named a National Player of the Week by Collegiate Baseball, and he was noted as part of the weekly Associated Press recap. The Springfield, Mo., native was also named the Horizon League Batter of the Week. All five of Kendrick's hits in three games at the Riverview Inn Governors Challenge in Clarksville, Tenn., went for home runs, and he drove in 11 of YSU's 13 runs at the tournament. He hit a solo home run in the season opener against Austin Peay, and he followed that up with two homers - a solo shot and a three-run home run - against Indiana State on Saturday. He concluded the week by hitting a grand slam and a solo home run as part of a six RBI day against Illinois State. Kendrick already has more home runs in three games than he did all of last season (four). In fact, only one Penguin, Phil Lipari in 2014, has hit at least five home runs in an entire season in the last four years. Kendrick and the Penguins will begin a three-game series at Georgia Tech on Friday at 4 p.m. Youngstown State and the Yellowjackets will also play on Saturday at 2 p.m. and on Sunday at 1 p.m.